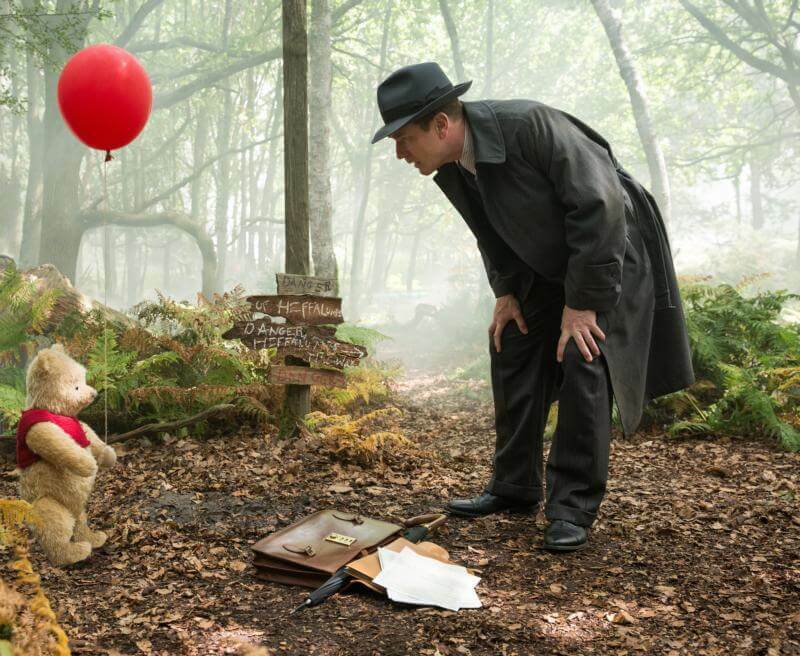 Photo Credit: CNS photo/Laurie Sparham, Disney - Ewan McGregor, as Christopher Robin, shares a scene with Winnie the Pooh in the live-action adventure movie "Christopher Robin." The Catholic News Service classification is A-II -- adults and adolescents. The Motion Picture Association of America rating is PG -- parental guidance suggested. Some material may not be suitable for children. It’s always dangerous to tamper with perfection. And, if there were ever a perfect world, it must be that of the Winnie the Pooh literature created by author A.A. Milne and illustrator E.H. Shepard in the 1920s. So fans young and old may be forgiven for approaching the fantasy film named for Pooh’s owner and friend, “Christopher Robin” (Disney), with trepidation. Happily, all such anxiety turns out to be misplaced. This is a magical and enchanting riff on the original. Its underlying values, moreover, are entirely in keeping with a Christian outlook. After introductory scenes evoking the melancholy of the youthful Christopher Robin’s (Orton O’Brien) last visit to Pooh’s realm, the Hundred Acre Wood — the lad is about to depart for boarding school — we’re introduced to the grown-up version of the title character, played by Ewan McGregor. Spiritually, at least, the years have not been kind to him. Now a harried middle-aged efficiency expert, Christopher consistently prioritizes work over family life. So much so that his misguided behavior is about to provoke a crisis in his relationship with his devoted wife, Evelyn (Hayley Atwell) and loving daughter, Madeline (Bronte Carmichael). By a happy accident, Winnie (voice of Jim Cummings) chooses this moment to pay a visit to his old pal. The other inhabitants of the Wood — most prominently Tigger (also voiced by Cummings), Eeyore (voice of Brad Garrett) and Piglet (voice of Nick Mohammed) — have all suddenly disappeared. Alarmed and lonely, Winnie makes his way to real-world London where he hopes Christopher will be able to help him. Though initially delighted at the reunion, Christopher’s patience with accident-prone Winnie wears thin quickly. To prevent further mayhem, he decides to transport the bear back to his native setting. Christopher’s return there enables its other natives, once the mystery of their absence has been solved, to join Winnie himself in gently showing Christopher the error of his materialist ways. Director Marc Forster and screenwriters Alex Ross Perry, Tom McCarthy and Allison Schroeder make deft use of Milne’s immortal figures, marshaling droll humor to convey the message that there are better goals to be pursued than merely getting ahead. Their leisure-loving Winnie is something between an unwitting philosopher and Zen master with a knack for asking the right question. His bewildered observations on the bustle of London are hilarious, as is Eeyore’s perpetually pessimistic running commentary on life in general. Problematic elements are entirely absent, the raciest exclamation in the dialogue being “Cripes!” But the film is too sophisticated for tots, who might also be disturbed by its scenes of mild peril. Even preteens, however, may find it a source of delight, as will a broad swath of other age groups. It’s a rare treat for all but the littlest members of the family. The film contains a mature story line and nonviolent action. The Catholic News Service classification is A-II — adults and adolescents. The Motion Picture Association of America rating is PG — parental guidance suggested. Some material may not be suitable for children.